Vinification and aging: fermentation takes place in oak barrels at a controlled temperature . Spontaneous fermentation due to wild yeasts and a medium-long term maceration of the grape skins. Ageing for 18 months in French barriques. Tasting notes: brilliant ruby red and deep, intense aroma of red berries such as blackberries ripe blueberries currants, pepper and vanilla’s hint. In the mouth has a soft entry and spicy, smooth and velvety tannins. It has a large and persistent aftertaste. 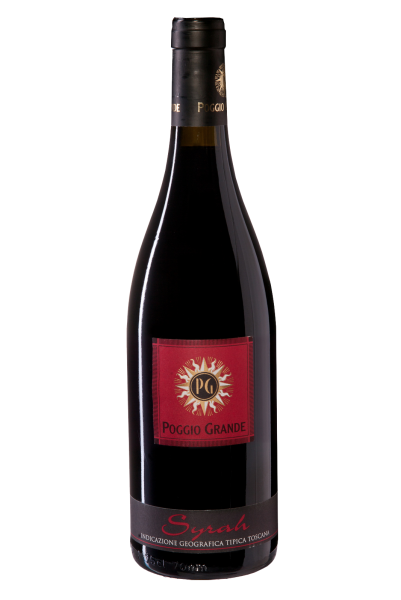 Syrah Poggio Grande is a niche production of 1,500 numbered bottles, which can surprise even the biggest fans of this grape variety. Serve with: read meat, roasted meat and aged cheese.